Of the eight Popes who shepherded the Church from 1903 to century’s end, none is so hotly disputed as Pius XII, who reigned from March 2nd, 1939 until his death on October 9th, 1958. At issue is the Pope’s alleged “silence” in the face of the Holocaust. His defenders point out that in reality he was not silent. At the start of World War II Pius authorized Vatican radio to broadcast reports of Nazi atrocities in Poland. These ceased only at the urgent plea of victims reporting that the broadcasts intensified their sufferings. At the war’s end Golda Meier (later Israel’s Prime Minister), Albert Einstein, the World Jewish Congress, the American Jewish Committee and many other Jewish voices applauded Pius for doing what he could to rescue Jews: by providing life saving travel documents, religious disguises, and safekeeping in cloistered monasteries and convents, including the Pope’s own summer residence at Castel Gandolfo, where Jewish babies were born in the Pope’s own bedroom. The Israeli diplomat and scholar Pinchas Lapide commented: “No Pope in history has been thanked more heartily by Jews.” At the Pope’s death in October 1958 the New York Times took three days to print tributes to Pius from New York City rabbis alone. Seldom can a work of fiction have appeared at a time more favorable to its message. The 1960s saw publications by liberal theologians proclaiming “the death of God.” It was also the age of the Youth Revolution, with the slogan, “Don’t trust anyone over 30.” A play which purported to unmask one of the world’s leading moral authorities was a godsend to the propagators of these new and exciting ideas. The bureaucratically organized slaughter of six million Jews was an event so horrible that many people found it difficult to believe that ultimate responsibility belonged to a single individual, Adolf Hitler. Hochhuth helped them come to terms with the inconceivable by assigning co-responsibility to the one man who (Hochhuth’s Black Legend alleged) could have stopped the machinery of death, had he wished to do so: the Pope of Rome. Millions who had never experienced the reign of terror imposed on Europe by the Nazis during World War II, with a totally controlled press and media, and people sent to concentration camps (which often meant death) simply for listening to news reports on British radio, welcomed Hochhuth’s indictment as an aid to understanding an event beyond the limits of what was previously considered possible. From 1963 onward Hochhuth’s Black Legend has reigned supreme. Accepted by all but a minority of historical scholars, and propagated without reserve by the media, it is still alive and well today. A book published in May of this year, The Pope’s Dilemma by the retired Toronto professor, Jacques Kornberg, accuses Pius XII of “moral failure” for concentrating exclusively during World War II on Church interests, without regard for extra-ecclesial events and concerns. 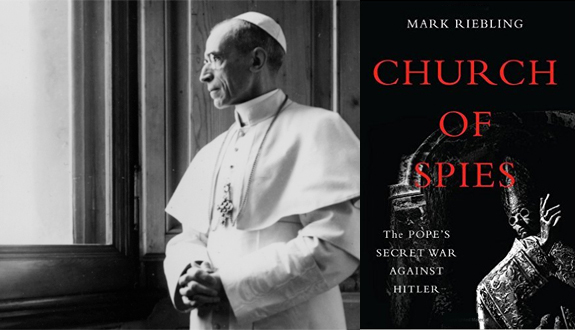 Comes now Church of Spies: The Pope’s Secret War Against Hitler by Mark Riebling, a blockbuster of a book which not only defends Pius XII (which others have undertaken with varying success) but utterly demolishes the Black Legend by showing in intricate and meticulously documented detail (107 pages of end notes and sources) that from the very start of the war the Pope cooperated secretly with anti-Nazi forces in Hitler’s thousand year Reich who sought, first, to remove the Führer from power; and when that failed, to kill him. The Pope’s aides were stunned. The highly respected British historian, Owen Chadwick wrote later: “Never before had a Pope engaged so delicately in a conspiracy to overthrow a tyrant by force.” The Pope, his co-workers thought, was going too far. Were Hitler to learn of the pontiff’s role, Hitler would take terrible revenge on Catholics, invade the Vatican, and kidnap the Pope. Later in the war Hitler actually ordered both the invasion and kidnapping, only to be frustrated by his generals’ foot-dragging. Central in this complicated and ever shifting story is the devout and heroically courageous German Catholic layman, Josef Müller, described by Riebling as “a big-eared Bavarian book publisher, who puffed a pipe and collected stamps.” We first encounter him on page 2 of the book, standing on April 8th, 1945, beneath a Nazi gallows, just minutes from execution. Only on the book’s final page do we learn how he was saved from this gruesome fate (he died in 1979): through an eleventh-hour phone call from the SS officer Walter Huppenkothen, commander of Hitler’s security guard, yet another secret anti-Nazi, whom Müller had befriended years previously. Müller worked throughout the war with Admiral Canaris, Chief of Hitler’s counter-intelligence network, and his cavalry officer assistant, Colonel Hans Oster. Like a number of those who served Hitler, both men were secret but determined anti-Nazis. All but Müller were executed by the Nazis just before the war’s end. Müller was also an airplane pilot. He is estimated to have flown a tiny light plane over the Alps to Merano in northern Italy some 150 times during war with permission of the government he was trying to destroy, carrying communications for the Pope from Hitler’s clandestine enemies. Müller also accompanied the well known German Protestant Pastor Dietrich Bonhoeffer to Rome, where the latter met with papal aides in the crypt of St. Peter’s Basilica. Another Protestant who worked with Hitler’s secret enemies was Count Helmut Moltke, called by the American diplomat George Kennan, “the greatest person, morally, and the largest and most enlightened in his concepts that I met on either side of the battle-lines in the Second World War.” Like Canaris and Oster, Moltke held a strategic governmental position in Hitler’s Third Reich, blocking the worst when he could, and paying with his life at the end of the war for his efforts. On the Pentecost weekend of May 22-25, 1942 Moltke hosted a meeting of some twenty people at his east German estate “Kreisau” (the “Kreisau Circle”) to discuss the building of a new “Decent Germany” after the war. Pius XII had helped plan the agenda, and was told about the discussion afterwards. Especially moving is Riebling’s account of Josef Müller’s private meeting with Pius XII, at the Pope’s request, on June 1st, 1945, just three weeks after the war’s end in Europe. “I had hardly crossed the threshold of his study,” Müller wrote, “when the Holy Father approached me, and embraced me.” He could hardly grasp how Müller had escaped. 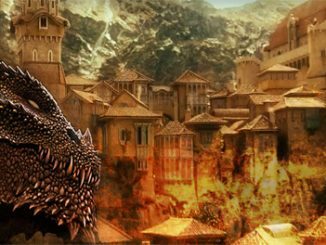 He felt as if his own son had returned from terrible danger. It remains to pay tribute to Riebling’s publisher. The book’s dust jacket, and the volume itself, are both completely black, save for a silvery partial sketch on the jacket of a sinister looking figure in an over-sized miter, his right hand raised in blessing. It is impossible to overlook this visual reminder of the long flourishing Black Legend which Riebling so successfully demolishes in these riveting pages. Fr. John Jay Hughes is a St. Louis priest and Church historian with a special interest in the Church’s confrontation with Hitler. His most recent book is the memoir: No Ordinary Fool: a Testimony to Grace.